The appearance of the catalogue number on the back of a Blue Note record sleeve can tell you a great deal about the origin of the vinyl pressing, especially during the transition of ownership from Blue Note to Liberty Records in 1965/6. Given the premium price which original pressings attract, and it pays to be alert to the telltale signs, which are often merely the style and size of font used in printing. Sometimes it is of no importance, at others it can be definitive. Here is an example of font difference. 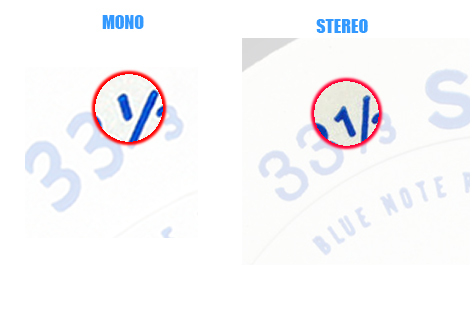 On every Blue Note label, the one in “thirty three and one-third” speed is sans-serif if it is Microgroove (Mono), and with a serif if it is Stereo. Not a lot of people know that, or need to, as it is completely irrelevant. 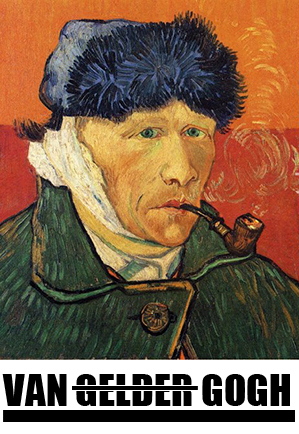 The point is to illustrate how our brains interpolate – fill in the gaps, or just assume what we expect. The Collector needs to pay close attention to detail. I will try to pick out the important identifiers in reading the back cover of Blue Note records. As always with these things there are anomalies which, for their own reasons, do not follow the general pattern of titles around them. 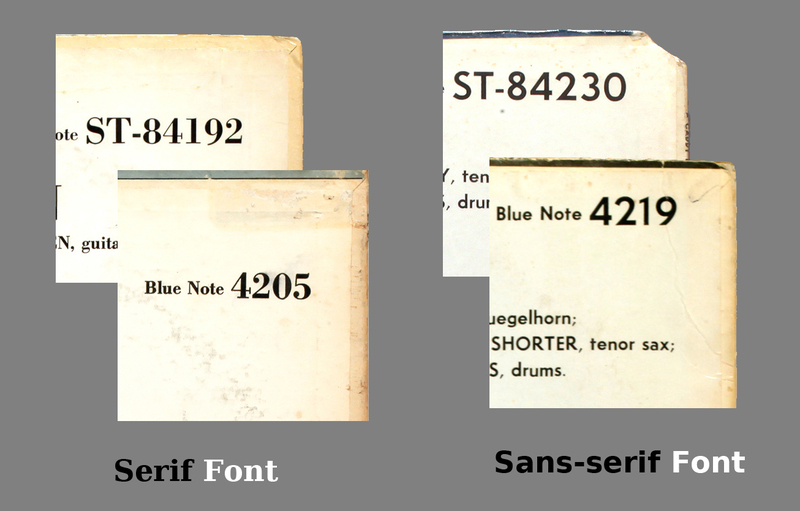 Typography professionals have spotted these well-known Blue Note covers, and identified the font used in the design. The above examples are all the work of Reid Miles, who successfully integrated type into design and photography to create masterpiece covers. 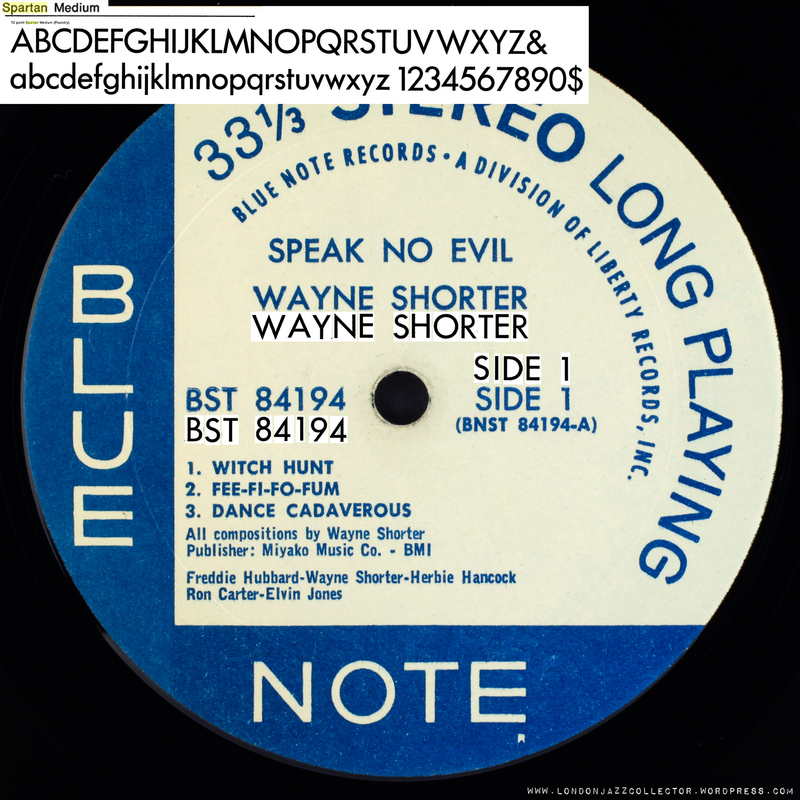 The font-style is a rough and ready indication of records issued by Blue Note with Plastylite pressings and those issued by Liberty pressed elsewhere. Be warned, there are a small number of exceptions, and further information may be required to confirm provenance. 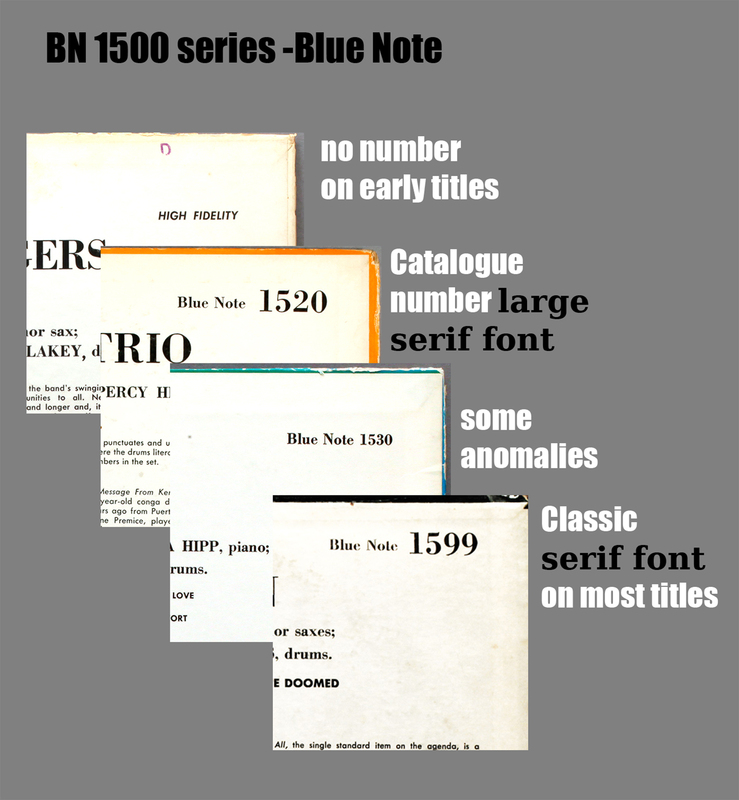 From 1956, the classic serif font is found on most Blue Note 1500 series and most of the 4000 series Blue Note originals in the Blue Note Years. 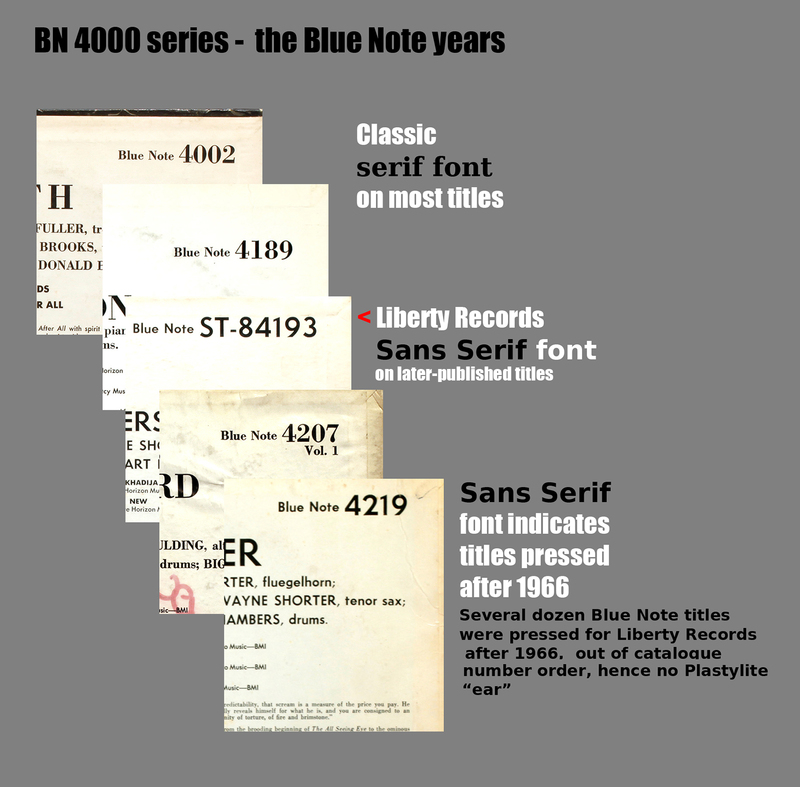 Then suddenly, sometime between 1965 and 1966 the house style of Blue Note covers changed from serif to sans-serif, coinciding with the change of management to Liberty Records. Reid Miles remained responsible for Blue Note cover design before and for some years after the sale to Liberty. The font change may have been merely a design-refresh, unrelated to the sale, however the timing remains significant as almost without exception, the large font sans-serif design covers are non-Plastylite pressings – without the Plastylite cursive “p” in the deadwax. Within a year or so the Catalogue number had shrunk to insignificance and then all-but disappeared from the jacket design. Miles Reid’s influence was replaced by whatever designers were in favour with the new owners. 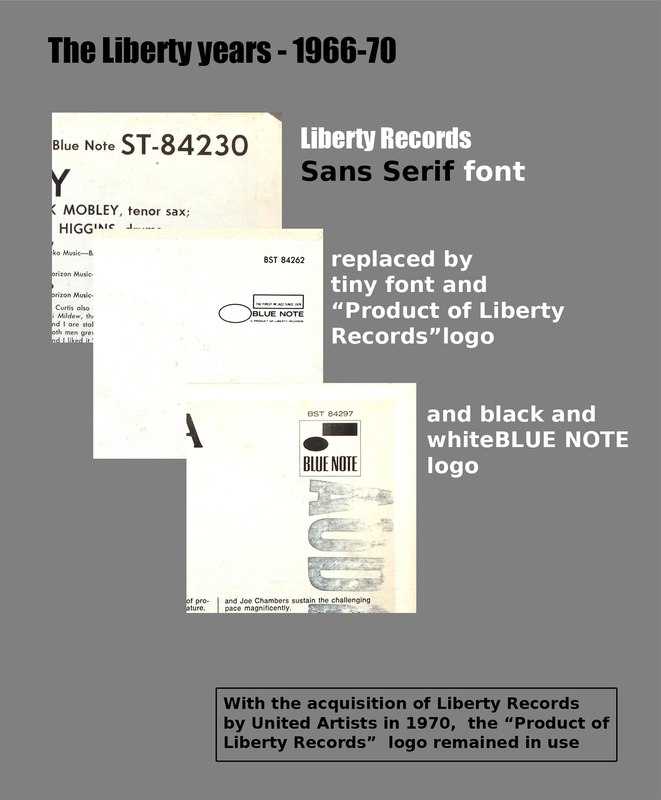 A large sans-serif catalogue number on the back cover is associated with “Liberty-NY Blue Note” – cover manufactured for Liberty. These include 4118 and 4171 ( font anomaly), 4193 Art Blakey’s Indestructible, 4203 Andrew Hill’s Andrew! !, 4219 Wayne Shorter’s All seeing Eye, and many other titles assigned a catalogue number by Blue Note Records Inc but whose release was produced by Liberty Records Inc. 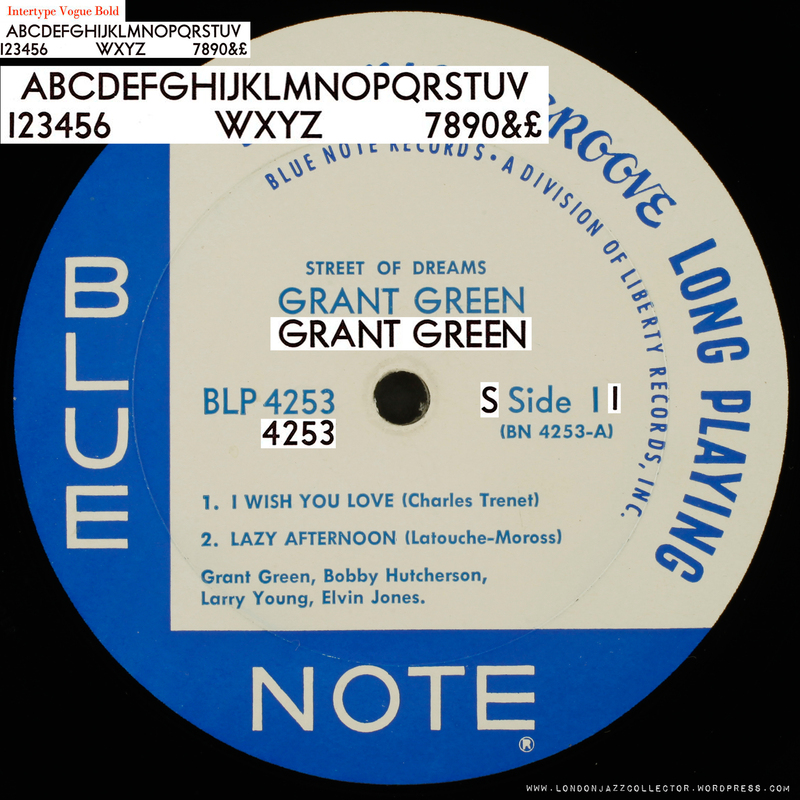 The “corporate design” of the Blue note classic white/blue label – microgroove and stereo outer block text and BLUE NOTE, in blue segments, remained a constant for whoever printed labels. It was the album-specific artist name and album title text font and typesetting that identified the printer linked to the pressing plant. 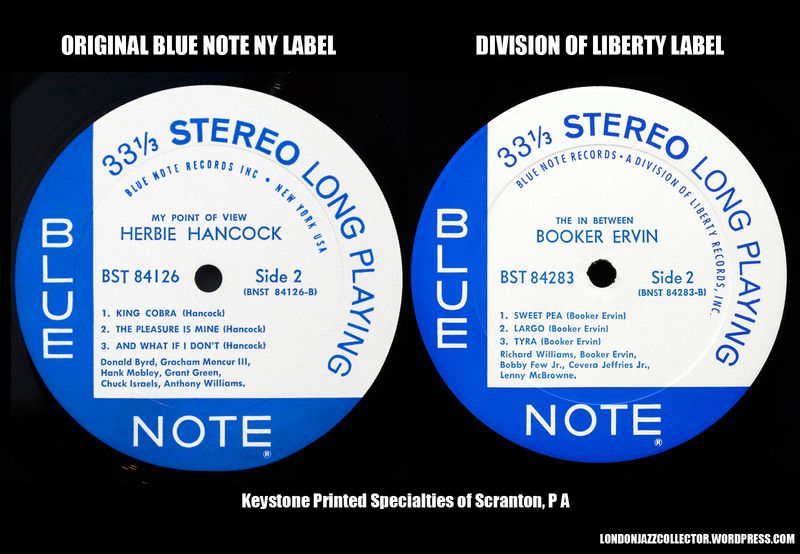 From 1956 to 1966, and possibly earlier, Blue Note labels were typeset and printed by Keystone Printed Specialties, Scranton PA. Keystone continued to print labels for Liberty Blue Note pressings on the East Coast, whose plants were predominantly All Disc Records Roselle NJ, Keel Mfg, Hauppage LI, and in the latter years , Columbia’s Pitman Plant, who had their own print facilities and different font preferences. On the West Coast the task of typesetting and printing labels fell to the Hollywood giant, Bert-Co., equipped with Linotype line-casting machines. Linotype’s geometric sans-serif font choice was Linotype Spartan family, and generally album title and artist name were printed in only uppercase Spartan at the same point size. The distinguishing feature of Spartan was that despite being a sans serif font, the number 1 as in “SIDE 1” has a horizontal left top serif. Keystone’s Vogue face has a pure sans-serif I – usually typeset in upper and lower case “Side l” with a simple without serif number I. Bert-Co also used the same inks for the whole label, including the elements of corporate design, and their incorporation symbol ® is poorly formed, due to type of ink and paper. 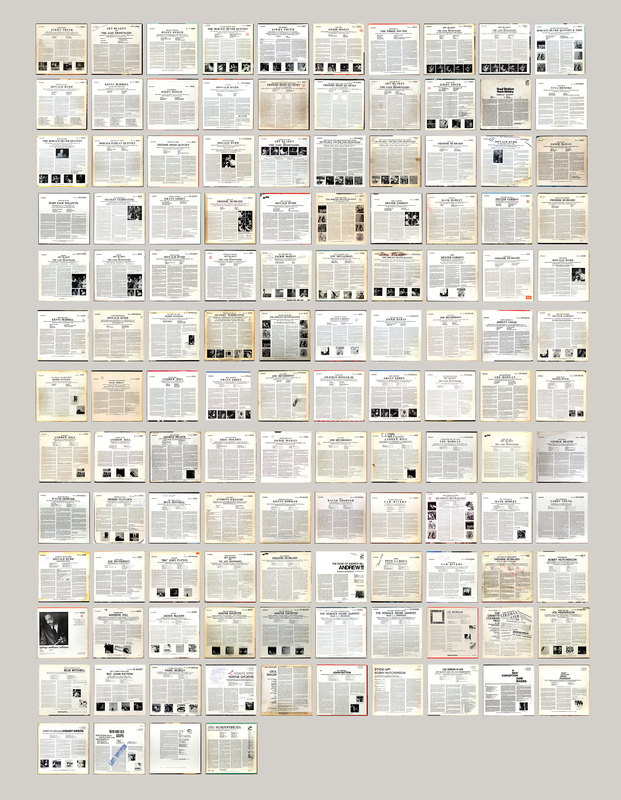 On purchase of the Blue Note company, Liberty Records acquired the old stock inventory of previously printed covers and labels, many New York USA labels, which were used in the reissue of earlier Blue Note titles by East Coast plants. Reissues by the West Coast plant Research Craft, who re-mastered reissues from copy tape, were required to print fresh Division of Liberty labels, which were typeset and printed by Bert-Co. These are easily distinguished by their font and typesetting choices (Spartan capitals only) , and drifting colour fidelity from the problematic Reflex Blue to intermixed shades verging on navy blue or excessive cyan tints. In the final years of Liberty – 1969-70 – Blue Note new releases were pressed at a variety of plants and the label printing devolved to whoever was local to them. I am also interested in knowing that font. This font is for the address below “MICROGROOVE”. The font looks like a script, likley a unique hand-drawn font. If you find out the name, even if it is only available via purchase, I am interested to know. Also, if you know, where can it be purchased. Likewise, I am interested in knowing the font type used for “MICROGROOVE.” Thank you. Any clue what the label font is on the “Blue Note Note Records Lexington 161 Ave NYC” part is? Or something Blue Note cooked up themselves? That font is IMO gorgeous. Most of these commercial fonts are proprietary – someone owns the design, and you have to pay a license for their use. Sounds crazy but this stuff pre-dates mass use of the internet and desk-top publishing. I have the experience how misleading the way is Americans are writing a seven: a couple of years ago I had laid my hands on a mint 6-eye copy of Kind of Blue (I always did with the Dutch Fontana pressings). The American seller had handwritten my postal code 74. The parcel ended up in 14 (Calvados, not a bad place to be). It has made the rounds of all the villages during two months before being returned to the US. It never occurred to the French post that it could have been 74 and I don’t blame them. Untill recently I always thought Blue Note’s adress to be 161 Lex. Ahh yes, of course 767. Brain freeze moment there. Not the kind of romantic image I had in my imagination. A reminder of the business side of the record industry. Hey LJC, I was in NYC not that long ago and wasn’t sure how close I was to some of these ‘famous’ BN addresses. Unfortunately after looking them all up and since time didn’t permit I wasn’t able to go by them. Of course the company I was with had zero interest, very sad….